​What Do You Need to Know about The Task Force on Climate-Related Financial Disclosure? 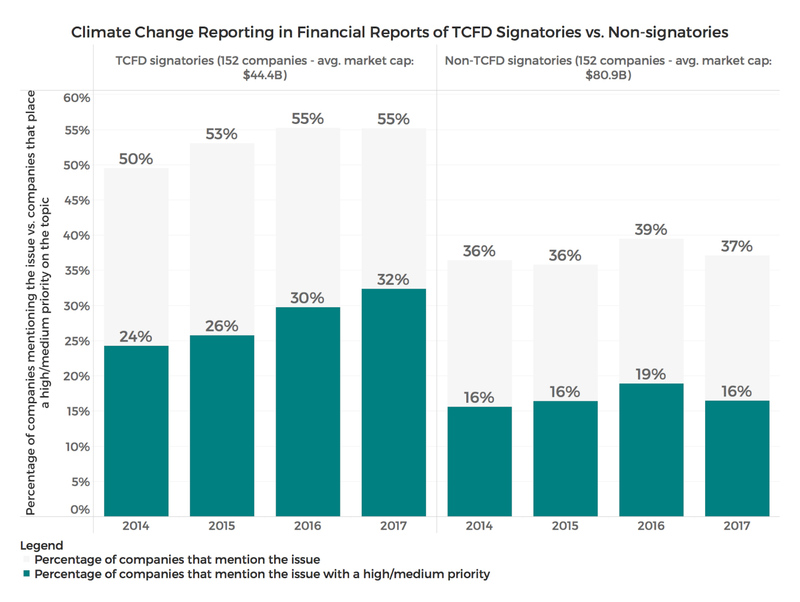 With over 200 signatories, The Task Force on Climate-Related Financial Disclosure (TCFD) is pushing companies to publicly disclose on their climate-related risks and opportunities. Established in 2015 by the Governor of the Bank of England Mark Carney in response to G20 request to better understand the financial implications of climate change, the TCFD is chaired by Michael Bloomberg. The Task Force bridges the gap between the corporate and finance communities as it invites companies to disclose how climate related issues can impact their business. The latter then helps investors, lenders and insurers to better assess climate-related risks and opportunities in their decisions. ​Metrics and targets to assess and manage climate-related risks and opportunities. Practical tools, insights and technical expertise is provided by the TCFD knowledge hub and the Climate Disclosure Standards Board (CDSB) - a consortium of businesses and NGOs advocating inclusion of climate change-related disclosure into financial reporting. In less than three years, the TCFD signatories account for $44 billion in an average market capitalisation per company. It has already managed to attract somewhat the biggest players from finance, utilities, extractives, consumer goods, technology and other industries. The TCFD members include the likes of; Diageo, PepsiCo, Unilever, Morgan Stanley, BHP Billiton, Akzo Nobel, Vale, Kering, Shell, Burberry, M&S, EDF, Engie, Salesforce, and Qantas Airways. When comparing the TCFD signatories’ climate change disclosure levels to non-signatories a striking difference can be observed. Supported by Datamaran data, two graphs below analyse members and non-members annual financial reports. They indicate how many times climate-related issues have been mentioned in their reports as well as priority given to these issues. Climate change as an issue in this analysis is comprised of topics, such as; Climate Change, Emission Trading, Air Emissions, Eco-efficient Transportation and Greenhouse Gases. Prioritising of the issue has been analysed by Datamaran’s proprietary Artificial Intelligence engine that interprets the narratives used in each document. Graph 1 represents across industry approach of the TCFD members and non-members. It indicates that signatories disclosure levels have been a double of their counterparts’ in 2017. A steady increase of disclosure is also seen among the supporters. Despite the diverse nature of its signatories, the Task Force majority is however predominantly represented by financial services firms, including the likes of; S&P Global, Nordea, National Bank of Canada, JP Morgan Chase, Caixa Bank, HSBC, ING and many more. Interestingly, they refer to climate change issues in their disclosure less than an industry average among signatories (see graph 2) - in 2017 it was 41% compared to 29% by the industry average. 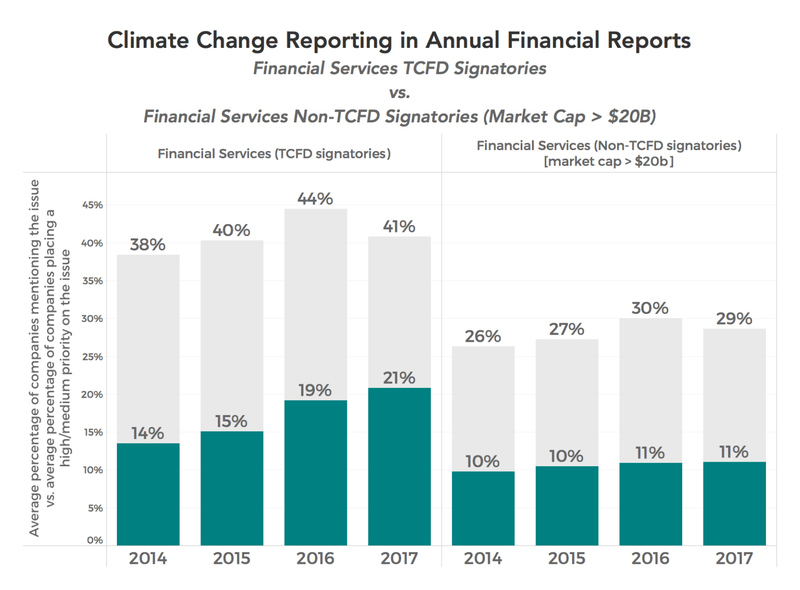 In contrary to all members, financial service signatories decrease a number of mentions in 2017 compared to the previous year, while increasingly placing a higher and medium priority to climate change issues in their disclosure. While more analysis has to be done - in particular looking into the correlation between climate change disclosure levels and financial performance - these graphs give a good sense of how businesses prioritise climate related risks. While the TCFD’s purpose and trajectory are clear, the implementation aspects leave some blanks. What does it mean for business? How long will it take before the TCFD requirements become a new standard? Where does it fit compared to other non-financial disclosure standards, such as the Sustainability Accounting Standards Board (SASB) or the Global Reporting Initiative (GRI), as well as industry initiatives, such as Climate Action 100+ or United Nations Environment Programme - Finance Initiative (UNEPFI)? What is the real impact on business?